1.5 PL heads for highest resolution printing. Equipped with auto height detection sensors. High quality liner guide rail for precision. Vacuum Bed to hold the media. Stainless steel body with high precision for quality printing. 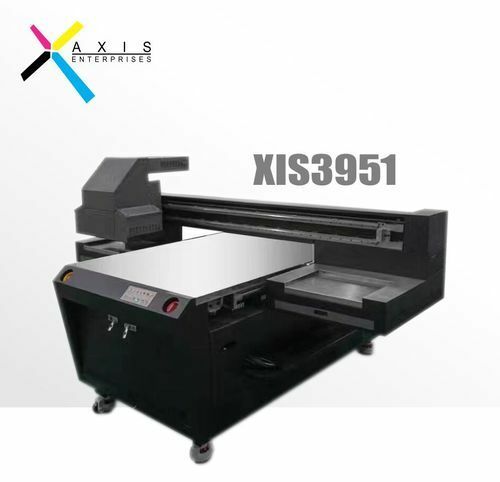 Intercepted in the year 2005, we “Axis Enterprises” are well-known and leading trader, importer and supplier of a reliable and qualitative range of Mobile Cover Printer, Leather Printer, Wood Glass Metal Printer, Metal Flatbed Printer, etc. We provide these products under the brand name "Axis Enterprises". Apart from this, we import these products from China. Located at Delhi (India), we are a Sole Proprietorship firm that is associated with the distinguished vendors of the market. Under the supervision of our Proprietor “Mr. Sanjeev,” we achieved huge client base across the nation.